$80 for better cable management. As sleek and powerful as Apple's latest MacBooks are, one of their shortcomings is the lack of ports and slots, like an SD card reader. And while that's easily fixable with a dongle, things can get tricky if you simultaneously want to charge your computer or pair it with your TV with an HDMI cable. 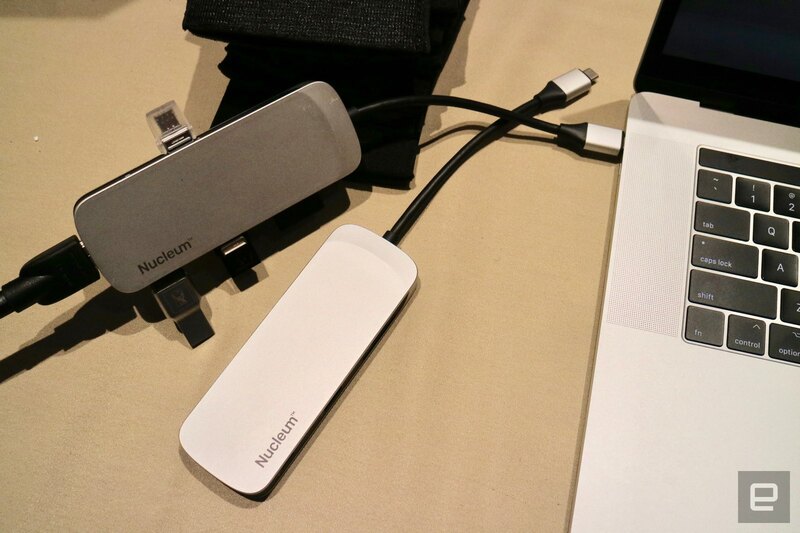 With that in mind, today Kingston launched its 7-in-1 USB Type-C hub, the Nucleum, which aims to save you from having to live the #donglelife. The device has two USB-C ports (one for power, the other for data), HDMI and a couple USB-As as well as SD and microSD card slots. Naturally, since the product is being geared toward newer MacBook owners, it sports a silver finish that'll match your Apple laptop. It'll definitely come in handy for many people, so if you're one of those, you can get it now from Kingston's site for $80. Jessica Conditt contributed to this report.